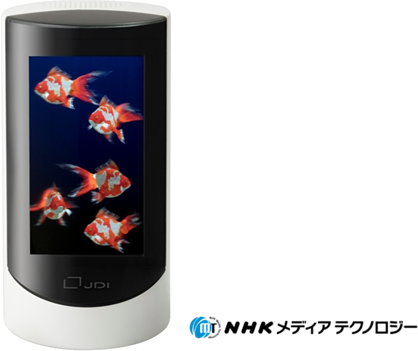 August 1, 2018 (Tokyo Japan) - Japan Display Inc. (JDI)　and NHK Media Technology, Inc. (NHK-MT) today announced a joint development project from which they have developed a 5.5-inch "Light Field Display"* which can realize natural-looking images in next-generation 3D video. JDI has already developed "Light Field* Display" in 17-inch 8K LCD. This time, JDI has succeeded in developing a compact 5.5-inch size display, aiming to install a "Light Field Display" into IoT devices. JDI and NHK-MT have collaborated to provide the most life-like 3D images and video by using their respective technologies. In the real world, light travels in an infinite variety of directions, and we recognize our three-dimensional world by the way in which we see this light. A "Light Field Display" simulates this infinite light concept and enables stereoscopic vision by reproducing light emitted in many different directions. Commercialization of "5G" will be started in 2020 and all devices surrounding people will be connected to the internet. JDI recently established a new corporate philosophy -- "With fresh perspectives and advancing technologies, we work constantly to realize a world that is inspiring and free of stres" -- as well as set up a new department (April 2018) to promote marketing and innovation, so that we are promoting "kotozukuri" (value creation) by utilizing JDI's #1 market share in small- and medium-size LCD displays, JDI's technological strength. JDI will create new future experiences within our "JDI Future Trip Project"
NHK Media Technology, Inc. is one of the major subsidiaries of NHK, Japan's sole public broadcaster. NHK Media Technology, Inc. is responsible for the technical operations of NHK programs and the development and operation of its computer systems. We thus support NHK's broadcasting by our state-of-the-art broadcast engineering and reliable information system technologies. As the media environment undergoes remarkable change and broadcasting services diversify, we are making full use of our twin-pillar technologies to challenge the very limits of these potentials in the industry. Our goals are to seek the better combination of broadcasting and telecommunications, and higher quality though 8K UHDTV production for the future.